All of my embroidery floss for my Lake Michigan bracelet. Lynne: This project told me something about myself that I did not realize before. The objects I create come from a need for something rather than from the parts themselves. I had to think of a need and then decide if the spools could fit that need. I spent most of the two weeks drawing spools in my notebook. I find that drawing my ideas first helps me find problems that could occur before I put any permanent glue in place. After pages and pages of spools in all different configurations, I found that the container I wanted for my colored pencils could not be made with the spools I had. I had to find another need. Since Kristin and I have been back from our Indiana Dunes trip, I had been wanting to make a bracelet that reflected the colors of Lake Michigan. Friendship bracelets have been the rage all summer and I thought a woven chevron would give me the effect I wanted. However when I went to get the lengths of embroidery floss I wanted, the bobbins kept falling to the floor always ending in the dustiest corner of the room. 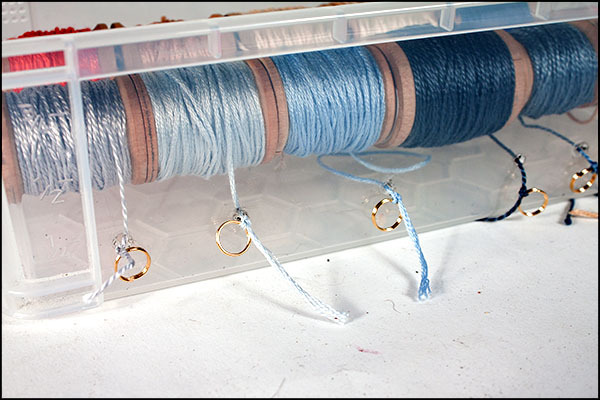 I decided I needed a covered box with a bobbin that would roll and there I realized was the use for my spools. I wound the floss I needed for the bracelet project onto some of the wooden spools. 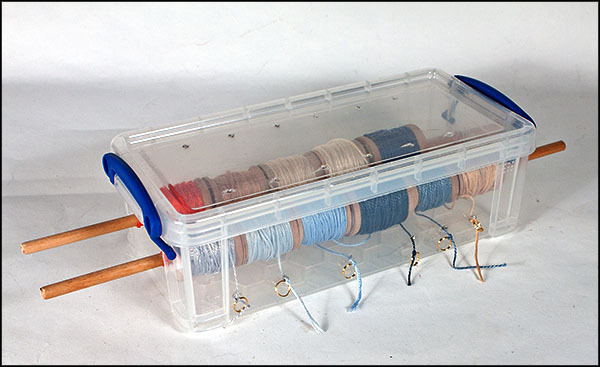 I threaded the spools onto two 12 inch dowel rods and put the rods into four holes that I had put in the plastic box. I used a heated awl to start the holes and then a craft knife to make them just a little larger than the dowels. I originally poked holes in the lid for the floss to come out of the box, but the threads tangled every time I removed the lid. I put new holes near the bottom of the box which worked great. I tied jump rings to the thread ends so they would stay in place. I cut off the jump rings when I need floss and retie them when I have the length I want. 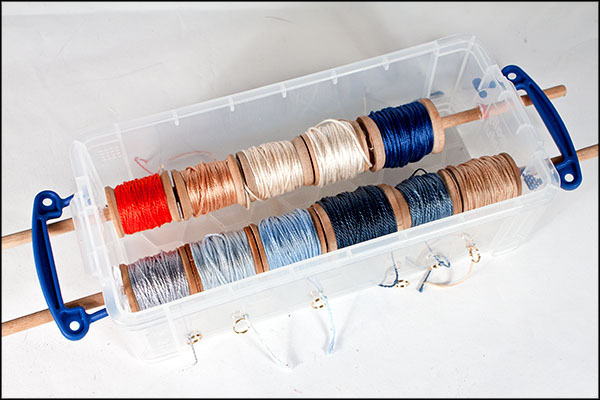 The spools can be changed depending on the colors needed for a project and the floss stays clean and neatly wound. The bottom photo shows the completed bracelet. We were not allowed to see or talk about anyone else’s project before the time limit was up. It was a lot of fun to get together and see what we had all come up with. The projects reflected each of us perfectly. We had a lot of fun with this and are already planning more. The box opens so I can change spools and colors. The ends of the thread are tied to jump rings. 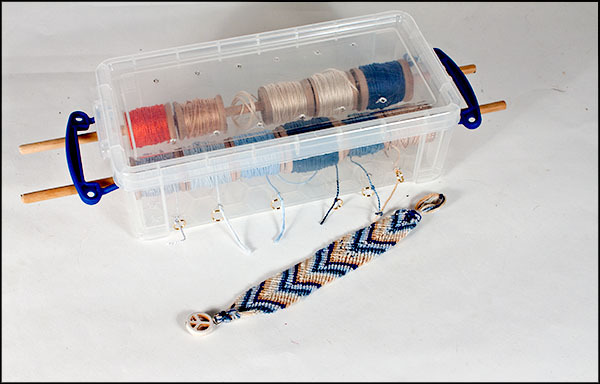 The finished bracelet with the project box. Lake Michigan on a rainy afternoon and umbrellas. Back on the road after the great time in Chesterton, we went to the campground hoping our campsite would be open early. It wasn’t. It didn’t help that we were an hour earlier than we thought. The northwestern counties of Indiana are on central time and we just a hundred miles away are on eastern time. Time is not a constant in Indiana. The gatekeeper sent us to the Nature Center to occupy our time, no doubt wondering about our clock reading skills. The best exhibit was a glass-walled room looking out onto a bird-feeding station complete with a microphone to pipe in the sound of running water and bird peeps. It was quite lovely and peaceful until I remembered the hummingbirds were trying to kill each other. Unfortunately, the Nature Center did not entertain us for very long and we were at a little bit of a loss about what to do when I thought: “Silly, you are at Lake Michigan. Go see it!” And we did. 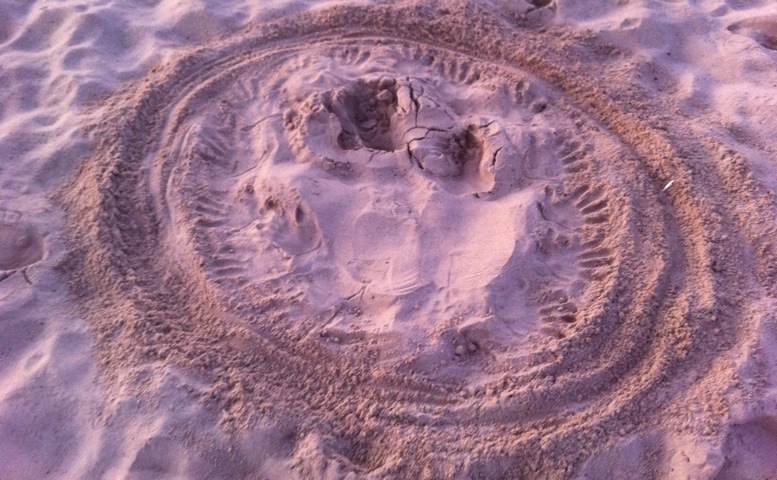 We went around a roundabout to a sign marked “beach” and there it was. Awesome, breathtaking, and blue. The photo above is one of the first of many I took. I just cannot get over the juxtaposition of the blue with the sand. And since it was raining there were people walking the beach with black umbrellas over their heads. I thought for a moment that we had exited the roundabout into a Victorian time warp. If you enlarge the photo by clicking on it you can just see them in the far right corner. 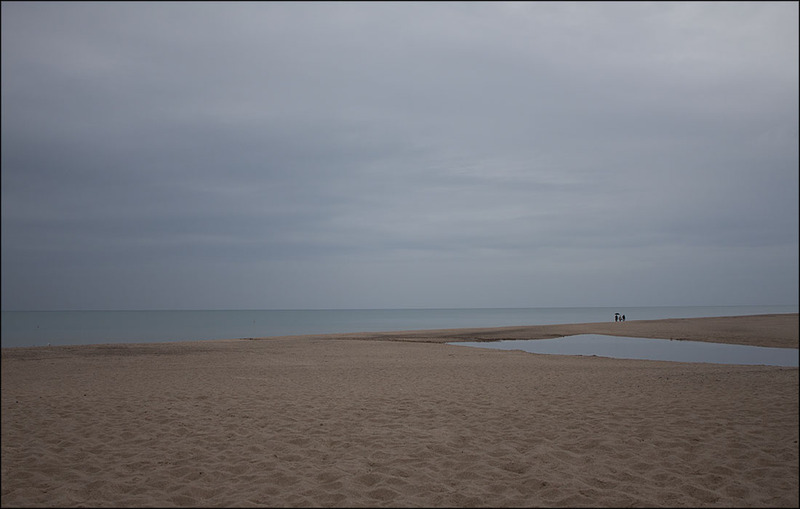 The blue, the sandy brown, the rainy atmosphere and the Victorian umbrellas were a perfect introduction to Lake Michigan. 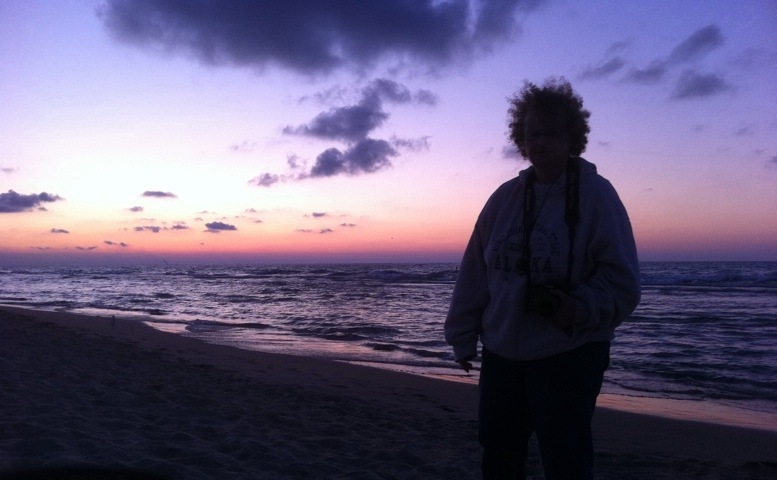 Lynne: This is my first entry in the sunset challenge with photos from the Indiana Dunes. We made it most nights to the Lake at sunset. I took so many pictures that it has taken some time to sort through them. I have to remember the maxim: You can take 100 photos and have them all turn out bad. I liked this one particularly because it shows the motion of the waves of Lake Michigan. I tried recording the sound of them but the low rumble that resounds in your body does not come through in my recordings. 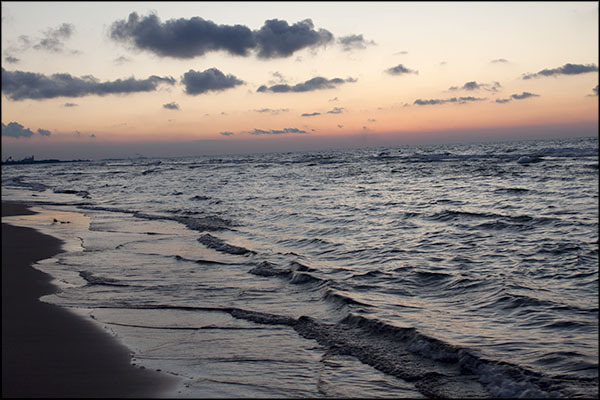 Perhaps you need all your senses, not just hearing, to truly know the dominion of such a body of water in motion. 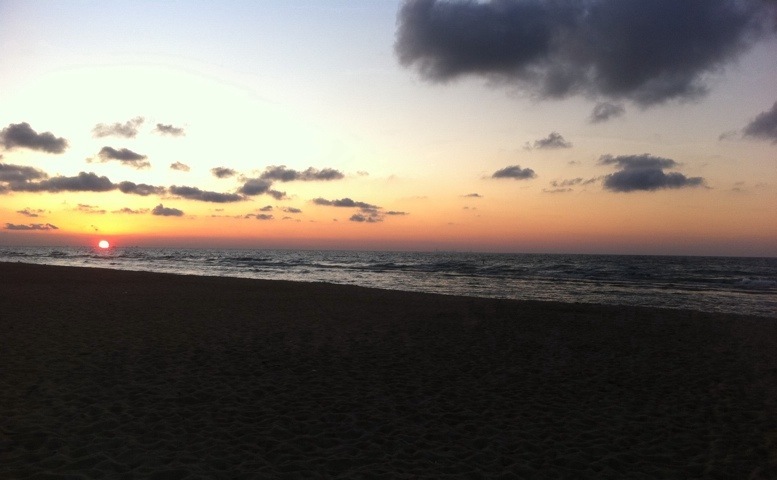 Here at the Indiana Dunes, the DNR posts the sunset times on their big activity boards. 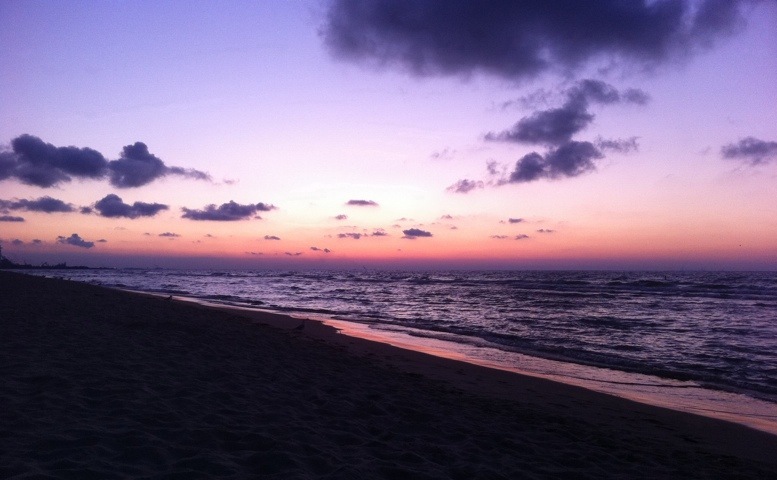 Last night we went to the beach and, along with quite a few other people, watched the sun set at 6:52 pm. It was really quite surprising how fast the sun went down. Within 15 minutes the beach was cleared of everyone but us. The best photos of a sunset (in my opinion) come after the sun has gone down. The colors are much more dramatic then. Mom took quite a few photos and I cannot wait to see how hers turn out.